Place the bacon into a 10-inch straight-sided saute pan and set over medium-high heat. Cook bacon until crisp and brown. Remove bacon and all but 1 tablespoon of the fat from the pan using a slotted spoon. Decrease the heat to low. Add the onion and cook just until they turn semi-translucent, approximately 3 minutes. Add the salt and apple and continue to cook for another minute. 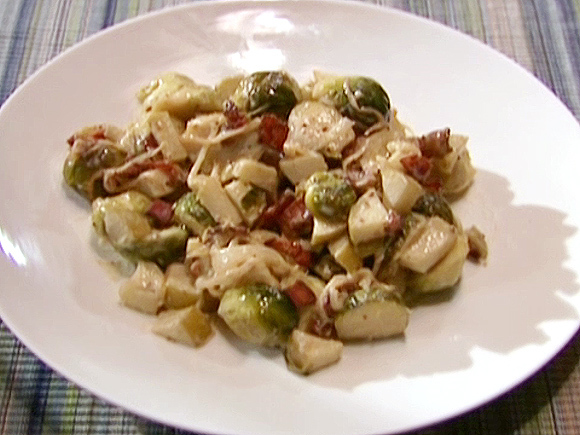 Add the Brussels sprouts, heavy cream and mustard and cook just until the Brussels sprouts are heated through, approximately 1 to 2 minutes. Remove from the heat and stir in the bacon, blue cheese and nutmeg. Serve immediately.